Why? Just why? Why the hell would anyone—especially a Canadian—do something as stupid and dangerous as driving with a completely snow-obscured windshield for absolutely no good reason? I’m both baffled and ashamed that I’m in the same genus as this non-genius. I mean, the car is entirely free of snow except for the one place where it really, really matters. Maybe I’m being to harsh? Maybe there’s a good explanation? Let’s see. 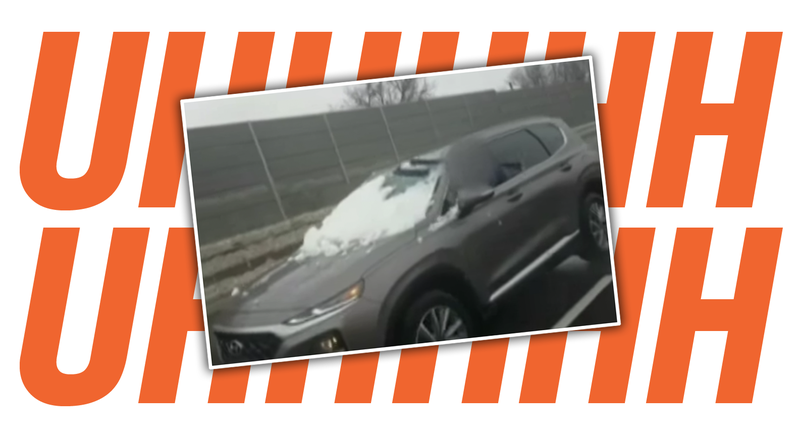 Okay, so, let’s look at what’s going on here: that still-quite-new Hyundai Santa Fe is pretty free from snow, save for its windshield, which is essentially entirely obscured. The car is still driving, albeit a bit slowly, on Toronto’s highway 401. While driving, the driver occasionally reaches out of the window to brush off a small portion of the windshield near the top to see out of. Now, I’d like to believe the driver didn’t start driving with a completely obscured windshield; more likely, the Hyundai just had a jaunty snow-hat, which slid down at some point when the SUV was braking. This is why you want to get snow off your roof, but this kind of thing does happen. What makes no sense is why the driver’s first concern wouldn’t be to get off the highway as soon as possible to try and remove the snow; stopping on the shoulder is never a picnic, but it would have been a smarter move here, so they could actually make it possible to see out of their car. Maybe they are planning to get to the shoulder, eventually? I hope so. It seems like they’re driving an awfully long time, though, but maybe that’s just because every drive while blind seems long. Maybe I was too harsh. But still, clean the damn snow off your roof. And if you can’t see out of the big window in the front, remember, you can’t drive by the instruments, either. Get off the road as quickly and safely as you can! Put on your hazard lights, stick your head out of the window like a dog, and take care of business!